Have you blown it with your kids? "Discover 10 Actions You Can Take To Earn Back Your Children's Trust... Guaranteed!" Don't make the mistakes this Bad Dad did! Bad Dad: 10 Keys to Regaining Trust to discover how to save the most important relationships in your life!" "... you won't be able to stop reading ..."
David Perdew held nothing back from his life experiences and miraculous turnaround in his ebook Bad Dad. If you are a parent, as I am, you won't be able to stop reading David's story. If you desire to improve your family life, read Bad Dad and apply it everyday. You and your kids will be glad you did. y the end of this letter, you will know how to change your relationships with your children. Never again will you see them as the problem. That's because there's a solution — a solution that brings love, respect and joy back to your family. It's found in the 10 secrets of Bad Dad: 10 Keys to Regaining Trust. Discover why this first — and some say most important — key is so-o-o simple, but so-o-o hard to implement. . .
You might not approve of this secret Key. . .but that just may be the problem, too. . .
Find out what is absolutely necessary to ensuring that you and your children are the biggest winners in the long run. . . Discover the single most important relationship required to foster love and trust with your kids. . . The three most incredible prerequisites for building lasting relationships with your kids are unveiled in this key. . . Discover the secrets to correcting your biggest character flaw. . .and how to turn that flaw to your advantage. . . Uncover the one key to repairing the damage caused by years of denial and pain. . .
Come to grips with the most difficult attitude change required to build a healthy, responsible adult. . . The most compelling reason to step up and embrace your role as a model for healthy interaction is unveiled in the final secret. . . But I'm ahead of myself already. First, I want to tell you a story about a really bad day in my life. You may relate — if not to the details, probably the feelings. I hope you never go through this. I thought telling the children that you and their mom were divorcing had to be the mother of all bad days, but it wasn't even close. It was just the beginning of the worst days to come. This is how it happened to me. Gathered in the kitchen, my wife and three kids sat around the table. With a shaky voice I whispered, "Your mother and I can't live together anymore because we don't love each other." My youngest son climbed into my lap as the two older children stood around with tears streaming down their face. He smiled, begging for approval, and said, "But you still love me, don't you, daddy?" As we both burst into tears, I squeezed him to my chest tightly. I didn't know how to help him. At 4 years old, he was feeling the trauma of his family. For years, the tension in the house had been so thick you could slice it. My anger and resentment toward my wife had been building while the kids tiptoed around the edge to avoid the abyss that we called our marriage. It was like living in a war zone. And they were the orphaned victims. This, I thought, is the worst failure of my life. I can't make this marriage work and I don't have a clue how to help these kids feel better. All I knew is that my life was crumbling. My own pain was overwhelming. And that's all I could think about. Like most young Dads, I had no training in parenting. The most important job in my life, raising my children, was a trial-and-error effort at best. After the divorce, I was no longer in the house. I was a failure. My kids didn't need to be around a failed dad, I thought, so I only showed up only when required — school functions, ball games, and the occasional movie. Emotionally, I had checked out. Work became my identity. That's when the real trouble started. As the kids grew into teenagers, we grew further apart. They no longer wanted to be around me. At the same time, they built great anger and resentment — after all, they'd learned that from the best. But anger and resentment turns to self-destruction. I watched as my kids began having trouble in school, sneaking out of the house, and displaying angry, disrespectful outbursts toward their mom. The young son who wanted so much to be loved would find himself in drug rehab at 16. That's a parent's worst nightmare: A child on drugs. If you don't understand why you must change your life after checking your child into drug rehab, then you're not ready for Bad Dad. Sorry to have wasted your time. But if you feel a little twinge of recognition in your gut, or you want to check your behavior patterns to ensure you're not making the same mistakes, keep reading. Is this you? Your brother or sister? A close friend maybe? Something is missing in your child's life. Chances are it's you. Listen, I understand. I feel your pain, believe me. You're scared, angry and hopeless. You have the best of intentions to have a pleasant conversation and a peaceful interaction with your kids, but soon you're arguing again. Hurtful things are said and the gulf between you becomes even wider. If that rings true for you, it's time for a new plan! Your old plan doesn't work any longer. The first was to ignore it hoping the pain would go away. That didn't work so well. The next plan seemed logical: If talking only drives the kids further away, then don't talk. Maybe if we just wait until they're grown, and try it again then. . .
Bad relationships fester with venom creating a cancer that robs us of our joy and our right minds. No longer can we make judgments that are clear and confident. Every conversation is a calculated risk. Even the small talk is precarious. No one likes living in this situation. And no one is in control. But everyone thinks they are. I live an enriched, fulfilling, happy, fun life and Dad taught me how to do that. He taught me to take what you have, a life that you hate, and turn it into a dream come true. It may have taken me awhile but I’m here now, and he gets the credit. Throughout my life, my dad was always the last one to know. I would avoid telling him things, because I was afraid of disappointing him. What I eventually did was leave him out all together. It was when I took my beautiful bride-to-be to meet him thatI finally understood. After all of those years, I was always afraid of the wrong thing. Not including him ultimately hurt us both. There were some times when I really didn’t feel comfortable around you because I didn’t know what you were going to do next. You were just so angry and that scared me. The only way that I felt I could get over the hurt of it was to make myself not care and the drugs really helped with that. I know that I have done, and still do, some things to really upset you, and make you angry but you still tell me you love me. And that is it. That is what a good father does. No matter what, you will love me and you make sure that I know that. Fifteen years ago, I would have given anything to just have my children enjoy spending the night with me. Today, we enjoy each other. . .ALL THE TIME! How about you? Are you getting the best from your kids? Are you giving them the best you have? Are you afraid you're making too many mistakes? Do you wonder if you're "scarring them for life?" That was me too, sure that whatever I did was wrong. And you know what? Most of the time it was. Do you know why? I hadn't found these simple keys to raising healthy, happy children. If fact, these secrets will work in any relationship — at home or work. Did you feel that? That little chill up your spine was HOPE! Yes, someone else has felt exactly like you. And yes, he did live to tell about it. And yes, I'm the guy — the original Bad Dad. Look at these two pictures below. 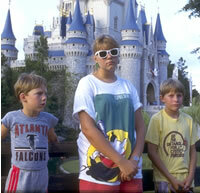 Before on the left shows my angry, depressed children with their angry, depressed dad at one of the most wonderful locations in the world — DisneyWorld. After 15 years of struggle, honesty, hard work, undying love and commitment, and a rock solid devotion to the 10 secrets contained in Bad Dad: 10 Keys to Regaining Trust, my kids are shown in the right picture sitting on my back porch, loving life and their dad. We express our love and caring, freely, openly and sincerely. We've built bonds that will never be broken. We trust each other to do the right thing, not always the easy thing. When both of my sons call from different parts of the world where they live with their wives, they say, "I love you, Dad" before they hang up. My daughter brings joy and laughter into the house when she drops in between trips to Costa Rica and other places her adventurous life takes her. It's a wonderful moment — the windows of our country house rattle with joyful laughter. And I beam with pride at the woman she's become. How about you? Have you heard, "I love you" lately from your kids? Wouldn't you like to? There's no magic pill, no book you can read that will fix your relationships with your kids overnight. I'm sorry. But that's a fact. That's true for Bad Dad: 10 Keys to Regaining Trust, too. But reading this story and using the nuggets of eternal truth captured in these pages will help you find, over time, the very same happiness I discovered. There's a story of two hunters who were lost in the woods during a wintry blizzard. Cold and despondent, they felt great hope and joy when they stumbled upon an old camp shack with smoke rising from the chimney. At last, someone who could help them get out of the blinding storm. The old man inside welcomed, warmed them by the fire, and drew them a map to the main highway. When the two hunters examined it closely, they became aggitated. "It's 10 miles back to the road," one said. "And it was 10 miles in, too," the old man responded. If you're standing, lost, in the middle of the woods, you need a map. Bad Dad: 10 Keys to Regaining Trust is your map to a successful future with your kids. The 10 keys will show you how to love your children again — even if you don't like them very much right now. Today, you're just 10 miles into the woods. Tomorrow, you'll be much further in. I'll warm you by the fire, and I've drawn a map for you. Without the map, you're still lost! With it, you're still 10 miles into the woods, but you know how to get out. After discovering these 10 keys, I thought of you! Really! Actually, I was a little worried for you. No, I didn't see your face or know your name, but I knew what you were feeling. And I knew that without Bad Dad: 10 Keys to Regaining Trust — or some other clear coaching from someone who's been there and done that, you would continue floundering through your parenting years missing what's really important. And my biggest concern? You will give up! That's what I wanted to do. I'm so worried that you'll make one of the biggest mistakes of your life — not claiming your Bad Dad: 10 Keys to Regaining Trust today. Why? What will you lose? Worst case scenario? You won't learn the secret to communicating effectively with your children — they'll be gone for good. . . If you wait any longer, it will be too late to reverse the troubles you're seeing on the horizon. . .
You'll miss the one secret that will ease the tension between your and your kids so you can begin talking again. . .
All your relationships may become poisoned by the constant stress of your out-of-control life unless you apply the most important simple secret of the three S's. . .
Laughter and joy will disappear from your house forever if you don't implement this all-important change in yourself. . . Eventually, all hope evaporates and you'll give up unless you follow the simple keys. . . I can tell you, doing the real-life research for this book was as much fun as pounding my hand with a hammer. After a while, the pain becomes the only thing you know, and your biggest worry is that someone will take the hammer away. Without the hammer, what will become of you? Bad Dad: 10 Keys to Regaining Trust shows you a way to stop the pain and replace it with a better experience, the experience of a joyful family that you deserve. That's why Bad Dad: 10 Keys to Regaining Trust is so important. After reading it and applying the secrets in this book, you'll enjoy parenting again. I promise! Absolutely guarantee it. And I also guarantee that it won't change overnight, so that's why I'm giving you a 1-year, no-questions asked, money-back guarantee. Read it, apply it, love parenting again, or get your money back. Just like it did for me, I believe that this, too, will work for you. Check back with me in one year. Mark it on your calendar. I want to know. If you haven't improved your family life, I'll return your small investment — no questions asked. What have you got to lose? Maybe the wife and children? I'm taking all the risk. And happy to do it. Why? I'm going to say this quickly because I don't want to scare you. This is the most important investment we can make together — so much so that it has become the Bad Dad mission. Here's a few reasons why? Helping you helps me and everyone else in the world. Imagine one generation of children all over the world who were nurtured, loved, healthy and prosperous. What would that world look like? Crime would go down. . . Prisons would empty. . . Welfare would become obsolete. . . Hunger would disappear. . . Fear would be unheard of. . . Respect would flourish among all men and women. . . This is just silly, right? This sounds like World Peace and that will never happen, right? Wrong! One person, one child, one hand, one smile. . .And it began with you. The Bad-Dad community is growing. More of us are concerned and doing something about it each day. Claim your copy of Bad Dad: 10 Keys to Regaining Trust below. We'll keep you posted with the latest trends and topics in positive parenting as well as start a dialog with you about your greatest fears, uncertainties and doubts. We'll point you in the right direction. And together we'll give this community a voice to be reckoned with. Peace, one child at a time. That's not too much to ask. We — and our children most of all — deserve it. If you rebuild your relationships with your children, they will be happier, more productive citizens. It's the most important job you can do toward building World Peace. But you do it at home — one on one, slowly, with passion and commitment. Bad Dad: 10 Keys to Regaining Trust is your guide map through the blinding blizzard of broken relationships. Yes, you might be able to find your way home on your own. But, why take the chance? To quote the Talmud, "If not now, when?" "All fathers need to read this book..."
"All fathers need to read this book, whether they think they're a 'Bad Dad' or not. David's courageous honesty about his own past mistakes should serve as a wake-up call to all parents about the ways in which our actions affect our children. Awareness is the first step to improvement, and David beautifully demonstrates just how possible it is to heal the father-child bond, if only the desire to do so exists first." "Never too late to be a wonderful dad!" It's never too late to be a wonderful dad! That's the inspiring message in David Perdew's painfully honest story of his disasters, gradual recovery and ultimate triumph in the world of modern fatherhood. This book is sure to be of great help and encouragement to every dad who's ever struggled in his relationship with a son or daughter and I'm more than happy to recommend it to my readers. "Honest and inspiring book "
My partner has suffered from his relationship with his dad, which turned sour as they grew apart and his dad was stuck in a vision of the world, last updated in the late seventies. Together we have 4 young boys now and if there is one thing we don't want, it's to see history repeat itself. Thank you David for your honest and inspiring book. It will help us in more than one ways to bridge the gaps between the generations! "An e-book like yours may help them feel less alone..."
As a Special Education Consultant, I frequently talk to parents who feel guilty about how they have handled things with their special needs children. Even though they may have been doing the best they could at the time, they still have regrets. An e-book like yours may help them feel less alone and encourage them in their efforts to be the dad or mom they want to be. "Thank you, David, for your gift of courage." David’s Bad Dad ebook seemed an interesting and worthwhile premise. Having someone lay the groundwork for instigating change would make change that much easier. This could be good, I thought. But not once did I think his words would apply to me. I was wrong. When I read “somehow, from a very early age, I believed that I needed to achieve great things and stand out,” thoughts of my father came to mind. A sob welled up from my heart. My throat tightened in that scratchy way while tears ran down my cheek. I saw a younger me looking at my father’s straight-A report cards while he reminded me that I didn’t try hard enough. I never compared myself with over-achievers. I didn’t spend hours studying to be a straight-A student or get perfect SAT scores. But I might as well have because deep inside I felt I wasn’t good enough. Over the years I’ve struggled with self-confidence, forgiving myself for many of my actions, and forgiving other people for the hurt I felt. In all that time I’ve never forgiven my father. It's taken me years to learn that I can’t change someone else. My father raised me to the best of his ability. I know he loves me. The way I reacted was my choice. I’ve finally forgiven him, and now when I say I love him, I won’t be holding back. Thank you, David, for your gift of courage. Your willingness to change your life helps me to change mine. Share this book with your family. Read it, talk about your experiences, and follow the exercises to create an opening to heal the damage of the past. And what if you're a mom? If you're frustrated or confused about the emotions you feel dealing with a Bad Dad, this book will help you. If you have the same tendencies - this applies to you as well. There's hope. It's called Bad Dad: 10 Keys to Regaining Trust. What's it worth to hear your child say, "I love you!" You could spend thousands on therapy. (And you may need to!) But read this book first to learn how to progress quickly, without wasting time and money. There's plenty of parenting books available on Amazon. A quick search on Amazon for parenting reveals 66,804 titles. But I guarantee you that none of them will walk you through the experience of reinventing yourself and discarding your Bad Dad ways. I spent thousands of dollars trying to figure out how to repair my relationship with therapy, counselors, books — you name it. But I needed to learn to crawl up from the bottom I'd created first. I wish I'd had someone in the same situation that I could talk to—another Bad Dad. That's why I wrote Bad Dad, to offer you hope, to show you how to be honest and open, respectful and non-judgemental. Bad Dad condenses my expensive lessons into an experience you can relate to. If you have to spend $30,000 to rebuild your relationships, I guarantee you it's worth every nickel. But start with this book and save yourself much time and money. Instant download of Bad Dad: 10 Keys to Regaining Trust so you can begin your transformation just minutes after you order and start on your path to regaining your family's trust. . .
Step-by-step account of how I created the change in my life that brought my kids back. . .
Introduction to communities and resources online that support you in making your own transformations. . .
A free preview of Bad Dad that you can send to your friends or others in need. . .
Free subscription to the Bad Dad blog to get the latest information as we get it . 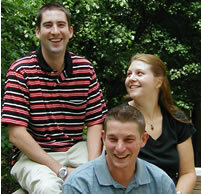 . .
Ocassional free special reports as they become available on parenting and self-improvement. . . Continuous online coaching in the form of eCourses. . .
And, of course, the special bonuses below. . .
Best of all, you get a new chance to regain the trust you've lost. You get the chance to have your kids see you as a new and improved dad. 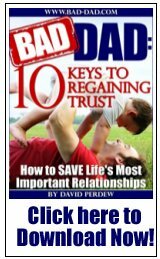 Get Bad Dad: 10 Keys to Regaining Trust today and re-ignite your family relationships. A very small investment of $19.97 is all it takes to begin anew. I almost pulled all of the bonuses, because I KNOW how important it is for you to get your copy of Bad Dad: 10 Keys to Regaining Trust and begin the change process today. I didn't want to distract you from that by confusing you with other resources. "This is Your Life, Not a Dress Rehearsal" Proven principles for creating the life of your dreams by Jim Donovan. This self-help classic has been translated into seven languages and is read throughout the world. Jim used the principles in this simple book, in his own life, to go from living a life of quiet desperation, to living a life today that is beyond his wildest dreams. Special Report -- Absentee Dads: A Child's Worst Nightmare! Special Report -- Teen Anger: To Discover the Source of Your Teenager's Anger -- Look Within! Special Report -- Teen Smoking: Is Your Teen Committing Suicide Slowly with Cigarettes? Special Report -- Deadbeat Dads: From Hunted to Healed. . . There you have it! Valuable, insightful and educational special bonuses—yours to keep even in the unlikely event you decide to take advantage of our ironclad moneyback guarantee! You can't lose with our 100%, ironclad, moneyback guarantee. Your satisfaction is assured through our no risk, you-can't-lose, 100%, no-questions-asked, moneyback guarantee. If for any reason, you aren't thrilled and satisfied with Bad Dad, just contact us (or send the product back) within 1 year and we'll refund 100% of your purchase price. No hard feelings. How can I be this generous? Frankly, no one ever requests a refund. You'll find this book can change your life. In fact, I'm so confident, I'll provide you a free preview that you can pass to your friends. You don't have to decide now if Bad Dad is for you. Just get it and try it. If it doesn't do everything I say and more, if you don't see yourself or someone you love in the first few pages, if it isn't life-changing, if it doesn't work for you, you have nothing to worry about because you can get every dime of your money back under our no-loopholes guarantee within 365 days — 1 year from today. So don't wait. Start today. Here's how to claim your copy right now! My dad will tell you he doesn’t think he tried hard enough, that he didn’t do enough that he wasn’t a good dad for a long time. But who he is now has helped me become who I am today. I live an enriched, fulfilling, happy, fun life and he taught me how to do that. He taught me how to take what you have, a life that you hate, and turn it into your dream come true. It may have taken me awhile but I’m here now, and he gets the credit. That brings tears to my eyes, but, of course, there's credit for everyone just because we all were willing to try again. P.P.S. Remember, our supply of the free bonuses is limited. I can only guarantee you'll receive them if you order right away. So don't delay. Act now.